For the online stores, the illustrations and patterns I create appear on various products. The companies provide the products, the printing, and the delivery of each finished piece. The artwork is delivered to them in the form of an electronic file and they do all the rest. 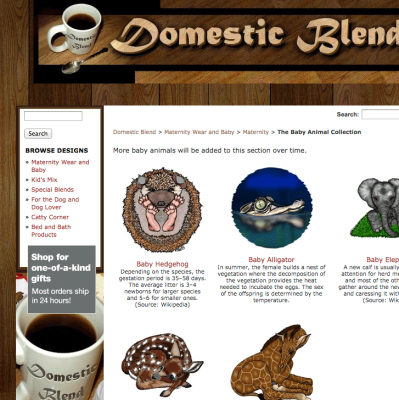 The copyrights for all of these images belong to Domestic Blend LLC. The copyrights for artwork sold through the stores is not for sale. For freelancing, I design illustrations that can be used in a much larger variety of ways. These materials are created and delivered electronically and ownership of the copyright belongs to the purchaser. If you are interested in having custom work created, please click on my freelancing link so that we can set up a contract. As of right now, we can work together using a monthly subscription, a fixed price, or an hourly rate of $10 an hour. Most of the designs you see in my stores are created using the Adobe Creative Suites, namely PhotoShop and Illustrator. I use a Mac Pro, but the images themselves can be used on any kind of computer. I am planning to set up my office and file storage completely using Google's G-Suite. I can create custom images that you can buy through the three sites specified on my main page. There is no charge for creating the custom design; I will retain ownership of the copyright and the design will be available for purchase to the general public as well as yourself. I have recently started working through Patreon, which is a subscription site. You can sign up for different Tiers of monthly billing which will offer a certain number of work hours per month. Please feel free to come visit me on Patreon! I have created illustrations for a variety of different uses; medical texts, children's stories, mobile applications, and jewelry. I've designed cliparts and logos for various companies, as well as materials used for parties, celebrations, and memorial keepsakes. If you are interested, please click on my Patron link so you can sign up with me on my Patreon website. I have created designs for patents in the past, simple schematics and medical layouts, and can also design the layouts for Comic and Graphic novels using the Amazon Kindle Application. If you are interested, please click on my Patron link so you can sign up with me on my Patreon website. I have produced other types creative work, such as wall murals, pumpkin carvings, yard decoration, and sculpture. Sometimes people only need pictures of the final product, while others need to have the items shipped. Some work requires that I travel. If you have an idea, please click on my Patron link so you can sign up with me on my Patreon website. Patterns can be tiles and used as a wallpaper to create fabric prints, model textures, on-line wallpaper, and wrapping paper. If you are interested in having a personalized pattern created, please click on my Patron link so you can sign up with me on my Patreon website. I have a couple of lower Tier levels on my Patreon site that I will be offering more interpersonal relations, along with some simple pieces of custom artwork. I plan to make a new one available each month. If you are interested in stories about how the art is created or if you just need a friendly ear, please stop by and sign up for one of my blogging/chatting Tiers.